Cala Deia is an exclusive and picturesque UNESCO place situated less than 19 miles away from Palma de Mallorca in the Tramuntana Mountains, Costa Nord. There are a few places in the world where you can really enjoy the Pure Nature. Cala Deia is that place. Unique and painteresque place, nice Sea Views to Cala Deia, Fine Restaurantes , one of them is with a Michelin star cousin. Relax and beauty of Nature. This villa is outstanding and we knew it from the moment we arrived. Margarita was so kind to have a beautiful fruit arrangement waiting for our enjoyment and welcome. She does an excellent job of replying to any questions you have before and after booking the villa. The setting is just as it looks and the home is very clean and well-maintained. The master bath had everything you need including a tub and walk-in shower. The kitchen was well-appointed with pans, utensils for cooking and a dishwasher. She had a few basic spices and oils on-hand, paper towels and nice coffee-maker for our convenience. We chose to grill out one evening in the beautiful grill area and she even made sure there was starter, matches and charcoal waiting. The living room was nicely decorated and comfortable as were the dining areas indoors and out. We appreciated being able to drive up to the home and lock the gate behind us and the home does have a security system, as well, although it is a very safe area. The pool area and pool chairs were so nice and the setting is incredible, getting to look out over the Mediterranean and beautiful Deia Cove just yards away. This is a beautiful but very comfortable home that a family can enjoy and take in the incredible scenery from the landscaped gardens to the sea and rising mountains. The home sits at the base of several hikes into the surrounding mountains along the ocean and up into the elevation that are generally 2-3 miles long and easy to moderate to climb. There are many local restaurants options in Deia, Soller or Valdemossa just a few miles beyond with beautiful mountain views along the way. I really cannot say enough about this home and we plan to return again some day to enjoy it again! Thank you so much for your wonderful review. I can also add that it was a great pleasure to receive you and your family in our villa! You are always welcome! I couldn't have had a better stay at this property. The house had everything needed for a relaxing and stress-free week, while the location and private path down to the Cala was truly unique. I would recommend to anyone without any reservations. The villa is simple but perfect. Very clean. With this villa it's all about the location, right next to the sea. I marked down one star as the fridge didn't work the entire time we were there but it didn't bother us as we were only staying a few days and ate out all the time. If I was there with my family I would have been fuming. Margarita is lovely although a little slow to respond to messages. Still these are small issues so don't be put off and make sure you go and stay! Thank you so much for your perfect stay and lovely reviews! I am on the way to buy a new one, so next week it will be all perfect. Hope to see you once again with your family or your wonderful friend! This fully furnished beach front property with private access to the waterfront is a gem. All of our family loved the villa, the pool, and the location. The views are spectacular. When we arrived we were greeted by a beautiful flower arrangement and a cheese/fruit platter provided by Margarita. She helped us with ideas of things to do during our stay as well as providing us with useful information about restaurants. This villa comes equipped with all of the necessary kitchen gadgets and dishes, bath robes, TV (which we did not use), an excellent WIFI connection, and snorkeling gear. We thoroughly relaxed in this beautiful villa. Cala Deia is a picturesque place to spend a holiday. There is a long & winding road, so be prepared to encounter other cars on this zig zag road, as well as bikers and hikers. If you take your time, it is worth the adrenalin rush to make it down to this rocky cove. There are 2 restaurants an easy 2 minute walk down the path from the villa. One serves until lunch until around 6pm, and the other serves dinner until around 8pm. 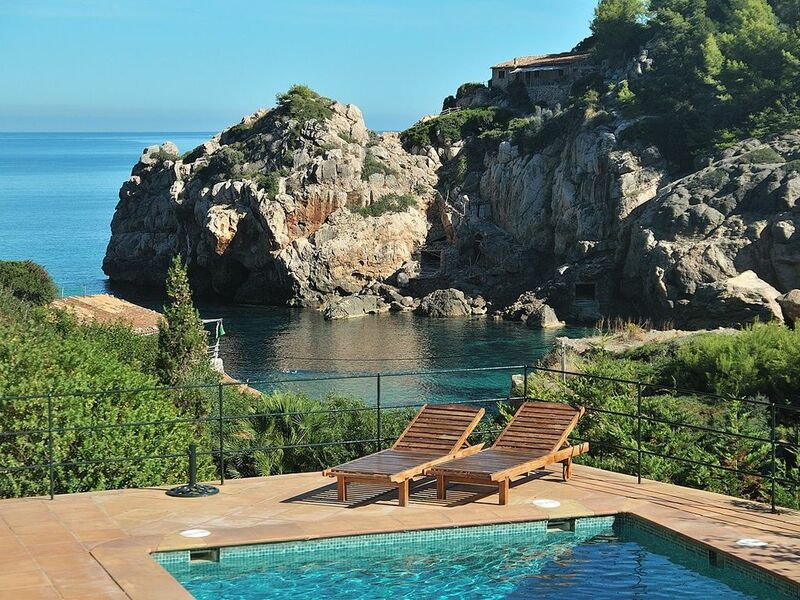 The pool and outdoor area of Villa El Laurel are a relaxing place to take in the beauty of the Med. The only disappointment was the seating in the living room (2 sofas that are sunken and incredibly uncomfortable) and the room doesn't truly seat 6 guests. The mattresses also could do with an upgrade, as they were very very firm. Although the breezes are lovely during the day, the villa must be closed up at night to ward off bugs. The upstairs bedrooms will get stuffy quickly, so be sure that the hostess provides you with the A/C remote controls when you check in, as you will be unable to operate the A/C without those remotes. This is a great spot for hiking, sight seeing, and exploring some of the most beautiful areas in Mallorca. Coleen Ludington , it was the invasion of vandals the stay of your family in our villa. You rode the villa on your very big SUV without warning an hour earlier before check in time. The air conditions recently installed, there was no need to put it on them in May when it is not hot and sleep with the windows open much nicer with the sea breeze and the sound of the nature! Otherwise It was immediately put on when you asked me about it. The sofas and mattresses are very comfortable , if it is not so, you could talk me about it., but nobody told me before that it is a problem. As a TVs American programs wich were installed immediately when you ask me about it! The information about restaurants is not correct, as the most information you leave there. It is a pity we had so ravenous consumers in this peaceful and pure nature corner of Mallorca. Sorry Colleen, but I cannot recommend your family to other hosts. Hope it was the only sad experience in our rental practice. C/ Archiduque Luis Salvador, 10, 07179 Deia (Mallorca) el:+34 971 63 94 20. ? Rate / week: 2-to 6 people depending on the season. The total price include water, electricity and cleaning once a week. We ask the second payment in cash at the check-in day.